Rheumatoid arthritis (RA) is a specific type of arthritis that is chronic, progressive and often debilitating, characterized by the symmetrical joint involvement and the age at which it begins. It differs from the more common osteoarthritis (OA) often known as wear and tear, spondylosis, degenerative joint disease (DJD) or rheumatism. It can also affect other parts of the body such as the heart, lungs, small blood vessels, the nervous system and eyes. When this occurs, it is referred to as rheumatic disease. Any type of arthritis involves inflammation which can cause redness, swelling, stiffness, pain, loss of joint function and eventually joint deformity. 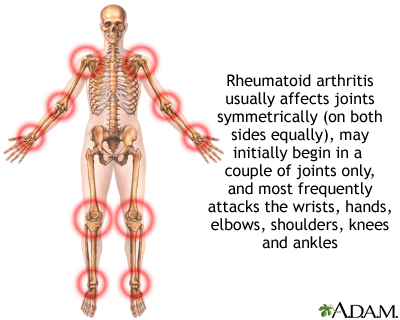 With RA, an auto-immune response - (the body's immune system starts to attack itself) causes damage to certain joints. The body's white blood cells (immune defence system) cannot differentiate from bad cells and its own body cells. Nobody knows what causes or triggers RA, but it has long been believed that infectious agents such as bacteria, viruses and fungi are involved in starting the inflammatory chain of events, although none have been proven as yet. Some scientists believe that certain environmental factors can trigger the inflammation to start, and that there is a hereditary link to RA with genetic make-up influencing who is susceptible to it. Who is affected by Rheumatoid Arthritis? 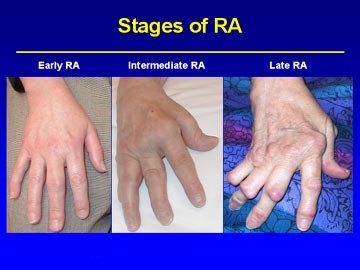 RA affects two to three times more women than men and typically occurs between the ages of 25 and 50 years of age, although the onset can vary to affect children as young as six months old as with juvenile rheumatoid arthritis (Still's disease)? also known as 'Juvenile Idiopathic Arthritis' (JIA). The joints affected by rheumatoid arthritis differ to those affected by osteoarthritis due to the nature of the disease. OA affects the weight bearing joints, which become more prone to erosion through wear and tear. The affected joint distribution is usually non-symmetrical and can affect the whole spine. 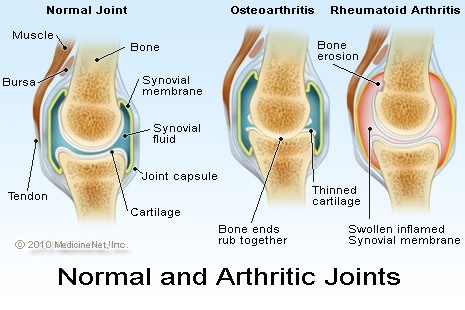 With RA, it is the synovial joints (specific type of joint) that are affected. The distribution tends to be symmetrical - with the most common joints affected being the smaller joints of the hands and feet, although it can affect any synovial joint. RA for example will tend to affect the smaller joints of the hands and wrists away from the fingernails, where as OA will favour the joints closest to the fingernails. To date, no-one really knows why some joints are affected over others with RA. In the past, some theories have included an increased blood supply being responsible for targeting the specific joints, although to date, these have not been proven. In a normal joint, the bone surfaces are lined with cartilage, which acts to reduce friction and helps absorb the stresses that are placed on the joint in everyday situations. Surrounding the joint is a very thin membrane (called the synovial membrane or synovium) that produces synovial fluid, and acts like a sac. This fluid is important in providing the nutrients needed to feed the cartilage to make sure it is healthy and provides as much lubrication as possible within the joint. Encapsulating the joint and synovium is the joint capsule - a tough coating which keeps everything together - to which ligaments and tendons surround, providing stability and movement to the joint. Damage to any of these structures can result in pain and swelling around the joint with a potential loss of function depending on the structure that has been injured. In OA, as a result of repeated stresses and shock absorbing, the joint space starts to narrow and the cartilage within the joint starts to wear away, becoming damaged. It becomes thinner and no longer provides as much lubrication as before. The joint surfaces therefore start to rub, causing irritation and pain which in turn causes inflammation and swelling. The bone surfaces react to this change by laying down more bone often in the form of spurs at the end of the bones themselves. The joint becomes deformed as a result causing further pain and stiffness, and loss of normal movement. These changes can be seen on X-Ray as a narrowing of the normal joint space, changes in the bone density (areas of increases whiteness) directly at the joint and bony spurs (osteophytes) present on the outer margins of the affected joints. In RA, usually an infection or incident will trigger the bodys immune system to attack its own tissues and start the inflammatory process. The white blood cells infiltrate the synovium surrounding the joints causing them to become inflamed. This causes an excess production of fluid within the joint itself and thickening of the synovial membrane (pannus formation). Pannus progresses to spread throughout the whole joint and starts to erode away the cartilage covering the ends of bone, and eventually the bone surfaces which ultimately results in the deformation of the joint. The changes can be seen on X-ray as the bone surfaces and margins are eaten away. The symptoms of RA can vary from person to person. When the disease is active, the tissues are inflamed. When the disease is in remission, the inflammation has eased and the symptoms disappear with patients generally feeling well. Remissions can occur spontaneously or with treatment and can vary in length between weeks and years in duration. When the disease becomes active again the symptoms return. The first symptoms of RA can start as pain, swelling and stiffness in one or more of the same joints in both sides of your body (symmetrical distribution). They can start suddenly (acute onset) or more commonly, over a longer period of time (insidious onset). The morning joint stiffness lasts considerably longer than 30 minutes and is often accompanied with poor sleep due to waking up in the middle of the night from the joint pain and stiffness. Patients will often experience fatigue, weight loss and generally feel unwell or have flu-like symptoms. Other parts of the body can also be affected, although this doesn't happen with everyone. The inflammation of RA can cause swelling under the skin in the form of rheumatic nodules - firm, non-tender nodules under the skin present in approximately 25% of patients with RA. These typically occur at bony areas where there is frequent pressure such as the elbows, but can also occur elsewhere in the body including the internal organs. Even though these do not cause any symptoms, they can occasionally become infected. RA patients can also develop inflammation of the membranes surrounding the internal organs such as the heart causing pericarditis, nodules and ischaemic heart disease. In some cases the lung tissue becomes inflamed (pleuritis), causing again nodules and fibrosis. Inflammation of the tear glands in the eyes and salivary glands in the mouth is often referred to as Sjorgen's syndrome, and will result in dry eyes and mouth. Rarely, inflammation can affect the blood vessels (vasculitis) causing problems with the skin in the form of ulcers and the nerves. It is usually visible as tiny black areas around the nail beds or as leg ulcers. Your GP and usually a consultant rheumatologist (joint specialist) are required to confirm the diagnosis and will base it on whether a certain number of criteria have been filled. These may be less obvious during the early stages of the disease, but can be confirmed with blood test results. A specific marker within the blood (rheumatoid factor or RF) is often present in RA and a selection of other inflammatory conditions such as Sjorgen's syndrome, dermatomyositis, scleroderma, systemic lupus erythematosus (SLE). However, if RF is not present it does not necessarily mean that you do not have RA, and likewise, if you do have RF it does not necessarily mean that you have RA. There are two different types of RA - sero-positive RA when RF is present in the blood, and sero-negative RA when RF is not present in the blood. However, the type of RA does not influence the treatment in any way - it is used as a diagnostic aid for the diagnosing physician. Once diagnosed with RA, the physician needs to determine at what stage of the disease you are in to come up with the most effective treatment plan and rehabilitation program. 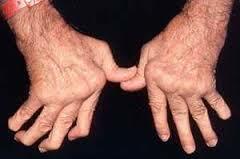 This is usually defined through the presence of rheumatic nodules, rheumatoid factor and x-ray changes. Due to the nature of the condition, the focus of the treatment is to suppress the joint damaging process. This is usually achieved through medication to control the inflammation and disease progression and is usually administered in the form of DMARDs, steroids and biologic agents. In advanced cases where medication is not sufficiently controlling the joint damage, surgery might be required to deal with structural changes. An early diagnosis is important to minimize the amount of joint damage and complications that can occur with RA and improve the quality of life. Click here for article "RA Exercises That Are Easy On Your Joints"